The following is a guest post from my sister at MidoriLei. Take it away sis! Can I be honest? I’ve killed quite a few indoor herbs and plants. Many an innocent plant has met their doomsday because of me. There was the dill plant, the thyme, the sage, and a family of basil (3 or 4?) Almost completely bald, my English ivy managed to escape my curse because my husband insisted we bring her out back, away from harms way (aka, me). 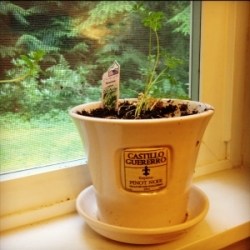 This herb is seriously strong. Hearty. It’s like a miniature bush. Instead of wimpy vines, it has something closer to branches. Its leaves are dense and thick. 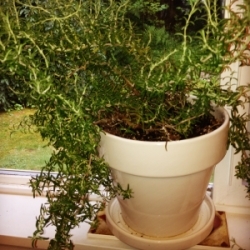 When all else fails, and I’m feelin’ down on my lack of gardening skills, I know I can count on my little gnarly shrub to make me feel better. Get a big one, let it dominate the herb garden like a king. Rosemary is great with anything chicken. Mince it, throw it in chicken and wild rice soup, slap it on a whole chicken with olive oil, salt and pepper. Toss a whole “branch” in the hollow part of the chicken with some lemon wedges for kicks, and roast it. Your house will smell heavenly. Your taste buds will rejoice. 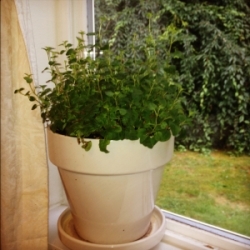 The second heartiest indoor herb plant, the queen, if I may, is the beloved spearmint. 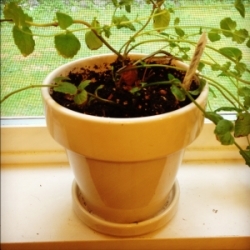 As many gardeners know, if you grow spearmint, you better contain her. Like a good queen, she is strong and assertive. We planted some mint in our flower beds a couple years back and gave up on tending the herb garden. We decided we were never going to be gardeners, so we’d be “mulchers” instead. Let’s just say after a year of neglect, my spearmint queen made it through winter with no care at all. Because she made it through winter, I knew she would do fine inside. Have company knocking on the door and don’t have time to brush your teeth? Tear of a small leaf, chew it and swallow it before you reach the door. Spearmint is perfect for summer Mojitos, yes indeed. They are a nice compliment to summery citrus or tabbouleh salads. This recipe by Giada De Laurentiis is A++++ and calls for mint. It has 5 stars with 113 reviews from the Food Network. Photo is from this site. Peel and trim the ends from each orange.Using a paring knife, cut along the membrane on both sides of each segment. Free the segments and add them to a medium bowl. Add the olive oil, lemon juice, parsley, scallions, mint, capers, orange zest, lemon zest, and red pepper flakes. Toss lightly and season with salt and pepper, to taste. Put a grill pan over medium-high heat or preheat a gas or charcoal grill. Brush the grilling rack with vegetable oil to keep the salmon from sticking. 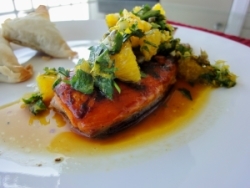 Brush the salmon on both sides with the agave nectar and season with salt and pepper, to taste. Grill until the fish flakes easily and is cooked through, about 3 to 4 minutes on each side. Transfer the salmon to a platter and allow to rest for 5 minutes. This guy is my latest replacement, so only a couple weeks have passed. Time will tell, but so far, so good. So far, it tends to be pretty low maintenance. I’ve already used fresh oregano leaves for this meatball recipe below. It is by far, the tastiest meatballs I’ve ever made. It was a big hit with my family and guests too. My husband says I’m a great cook, but let me tell you, I can be quite the klutz. Have I started a fire in the kitchen? Check. Because of my impatience, I tend to favor the “high” setting on the stove which drives my husband crazy. He can’t believe some recipes actually call for it. 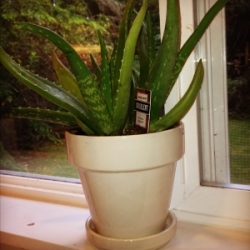 Anywho, because I sometimes (okay, often times) burn myself, I have an aloe vera plant right above the sink. Every time I burn myself, I immediately snap off the end of a stem and squeeze the gel-like insides to prevent blistering/scarring. My mom taught me this growing up, and it has always been handy. And because it’s a succulent plant, like a cactus, it’s great at staying alive when neglected:) It retains water, which is really, really convenient for someone who occasionally forgets to water her plants. The peace lily is one of those plants. Read more here. 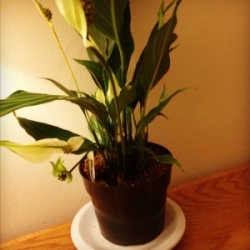 The peace lily has also been really low maintenance, plus it is beautiful! I love fashion and makeup, hip hop dancing, food, the color orange, cheesy romantic comedies and terrible pop music. You can find me at MidoriLei. This entry was posted on Wednesday, May 1st, 2013 at 9:42 pm	and is filed under Cooking, Food and Drinks, Home, Recipes. You can follow any responses to this entry through the RSS 2.0 feed. You can leave a response, or trackback from your own site. at the web the easiest factor to consider of. I say to you, I definitely get annoyed even as folks consider worries that they just don’t realize about. except the IAC and ECI which only accredits individuals. by a structured yet flexible coaching model. People who get adequate sleep do better on every measure of physical and psychological health. “Are we there yet. Guests will also complete the night surrounded by luxury in an Executive King Suite, featuring an expansive master bedroom, separate living space and a personal marble wet-bar. Furthermore they can present the show’s aim in an eye-catching way whilst retaining the seriousness behind it. ristiques de l’montres Omega Speedmaster Replica sont excellents. trise par la technologie, notamment des le. l’usure. Ce logo sp. De libres choix. personally or online and you decided to go out, try to consider these tips. You can’t afford to wait until they discover evidence. wwhat you are talking about! Bookmarked. Please addditionally discuss with my web site =). It’s going to be ending of mine day, except before ending I am reading this wonderful paragraph to inhrease my know-how.